Last week about this time, I was dreaming about jumping in the pool sipping a glass of Prosecco, thinking why is summer not here already? But I realized how much I loved spring just a few days later. We just spent 5days at Disney in FL with our tot, and the heat, all that walking made me appreciate beautiful spring weather. Dealing with a tantrum is never easy but when it's 10 degrees hotter, it's that much harder. Anyway, after all the sun, fun, and some episodes of tantrums, we are back home. We try to eat healthy most of the times but as we all know, on a vacation especially at a theme park resort, it's not super easy. Limited choices due to irregular schedule and TEMPTATION. So we all missed a home cooked meal badly. As we arrived late at night, we were passed out till mid morning with no desire to go grocery shopping. Lunch time comes, nobody seems to want to get some food in the fridge. Time to whip up something with what we have before I get HANGRY. Thankfully, I had some chicken in the freezer, and some veggies. And even cream. Yay! Well..that is not the healthiest ingredient but I wanted something a little creamy. 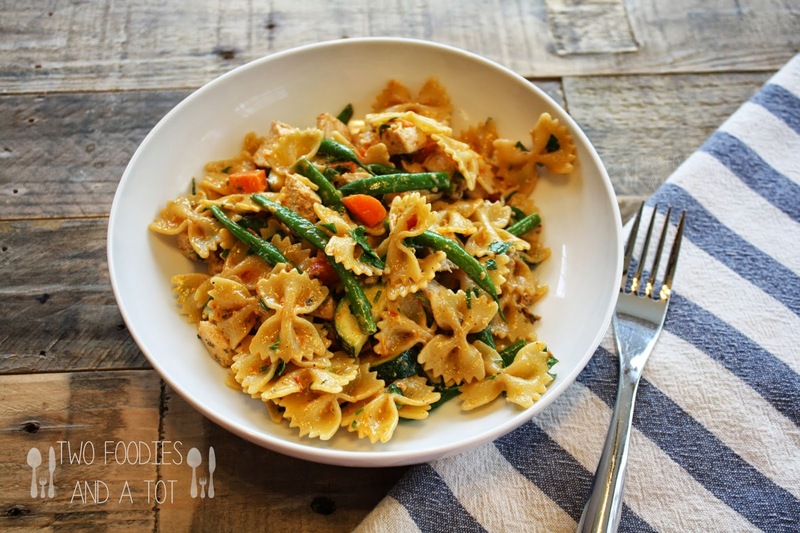 Oh creamy yet crunchy veggies and pasta. Satisfaction. This is a very quick meal even a two-minutes-before-hangry person can manage to cook. 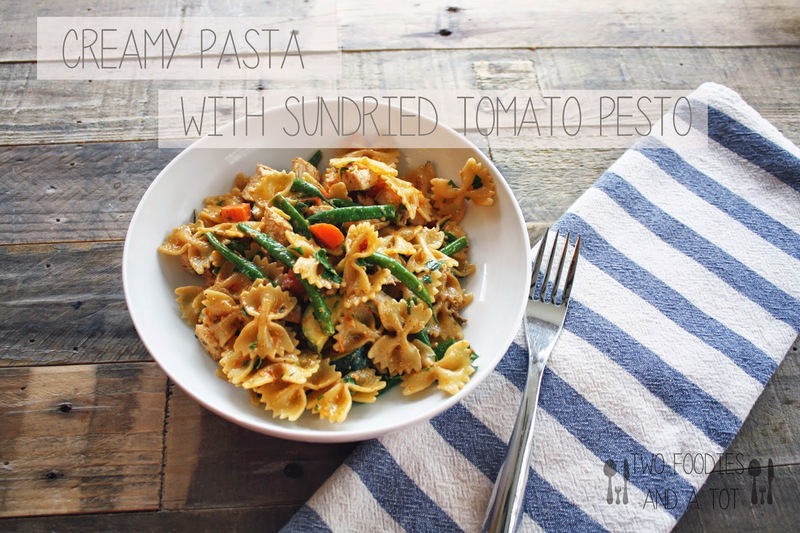 Makes 2 hearty portions in 15 minutes or so. Here we go. 1. Boil the pasta according to the package instruction. 2. Melt the butter in a skillet and add garlic. 3. About 2 minutes before pasta's done, add carrots and green beans to the pot. 4. Into the skillet, add zucchini and cook for a minute or two. 5. Add cream and tomato pesto to the skillet, simmer while stirring. 6. 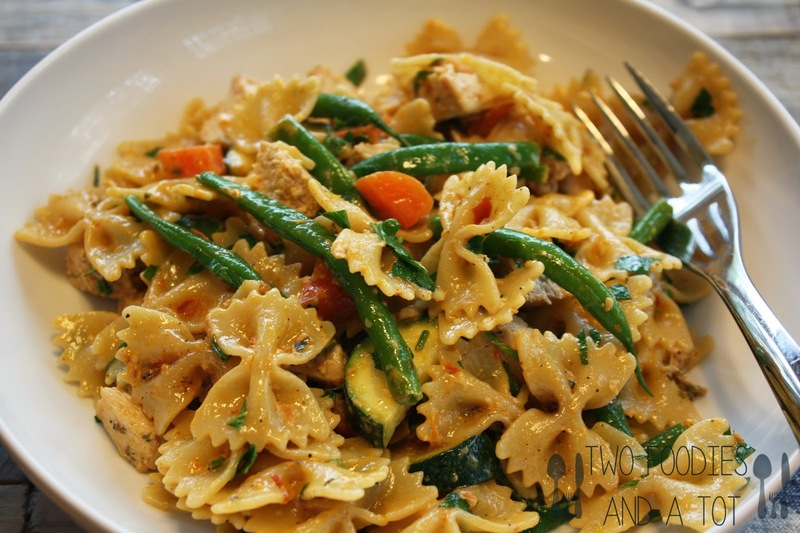 Add pasta, carrots, green beans and diced grilled chicken to it. 7. Add salt and pepper to taste and garnish with chopped fresh parsley.